Photographing flat artwork behind glass is challenging. One fundamental problem is the tendency of the glass to give reflections, which are not only distracting, but also veil the composition and detail of the artwork. One piece of advice sometimes heard is to “remove the glass”, but that, unfortunately, is not always possible or desirable. When necessary, I photograph the artwork in situ. 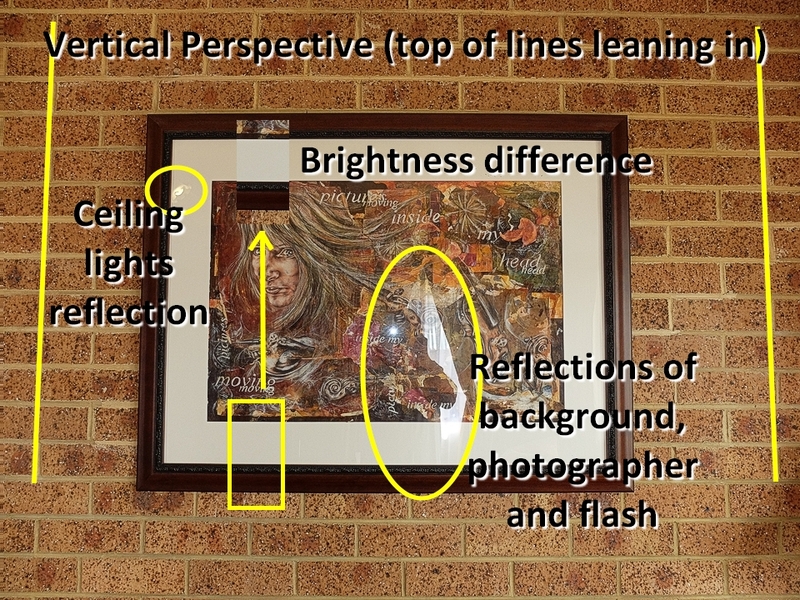 Problems encountered when trying to photograph artwork behind glass. 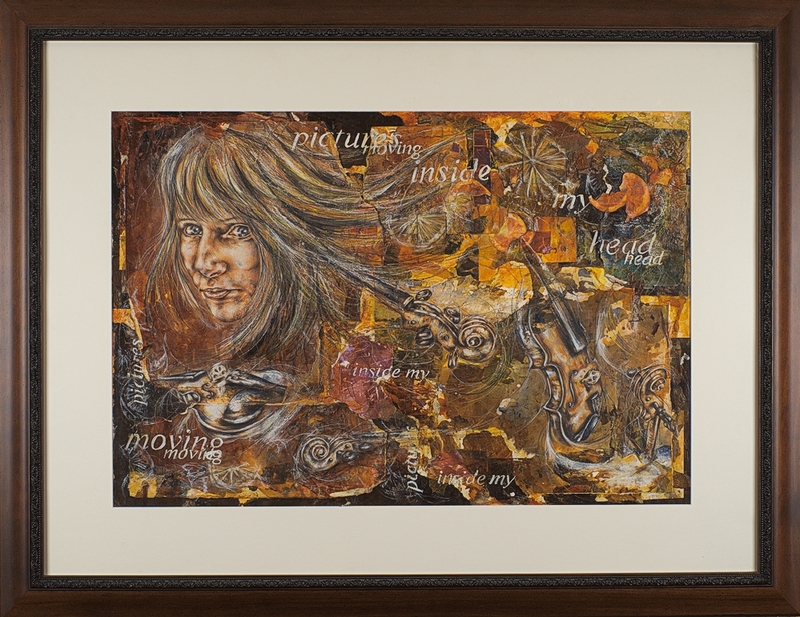 For the artist, it is important that the photographic documentation of his/her work be represented without any distortions. Such distortions could be inaccurate colour reproduction, or shape anomalies such as induced vertical or horizontal perspective, pincushion or barrel shape distortions, apparent curvature of flat surfaces, or any other artifacts of the copying process. When I copy artwork, I get things right at the moment of image capture, so that corrections in post-processing are not necessary. The process is fully colour managed. The camera is positioned with its optical axis precisely perpendicular to the centre of the artwork; (I use measurements to achieve this). 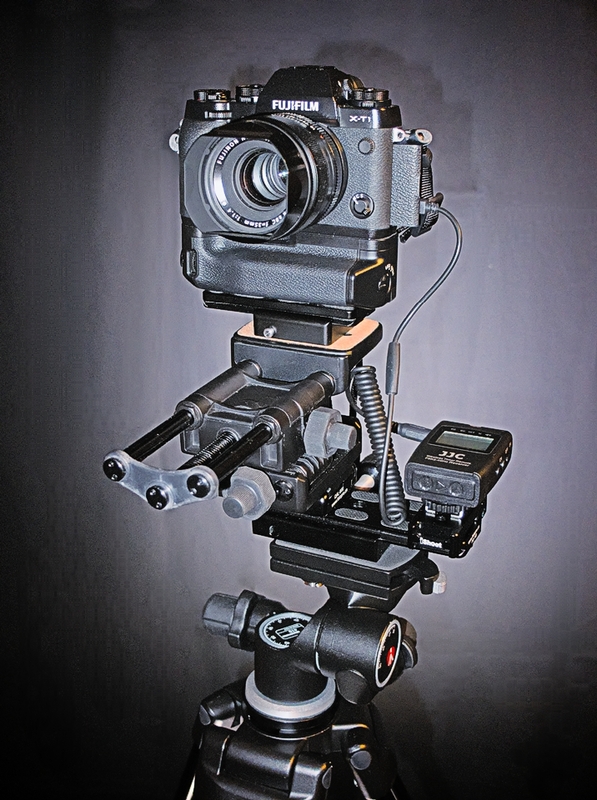 A multi axis micro-adjustable tripod head enables total spatial alignment. Photographed using continuous incandescent light source, giving an artificial warmth. 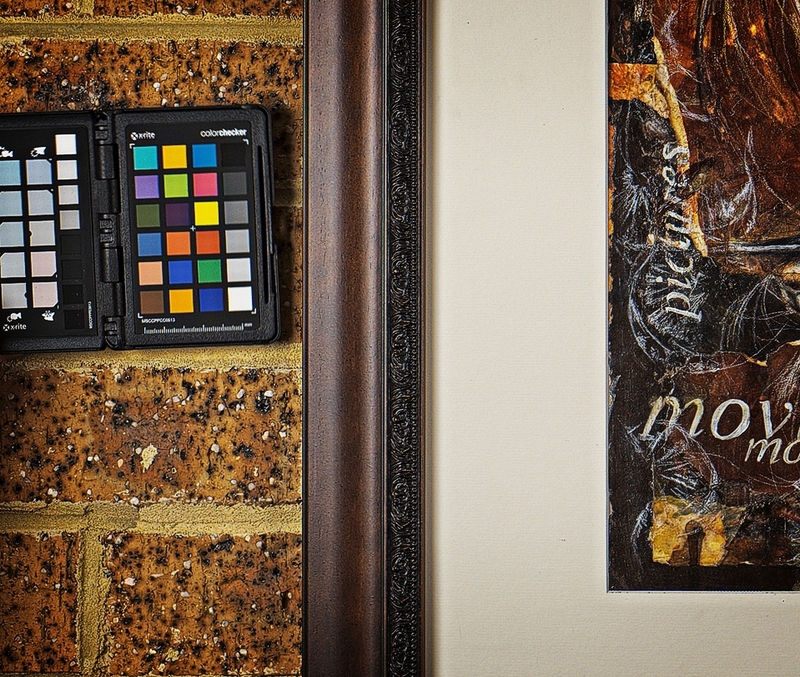 The ColorChecker ensures that the true colours can be realised in the processing of the image. 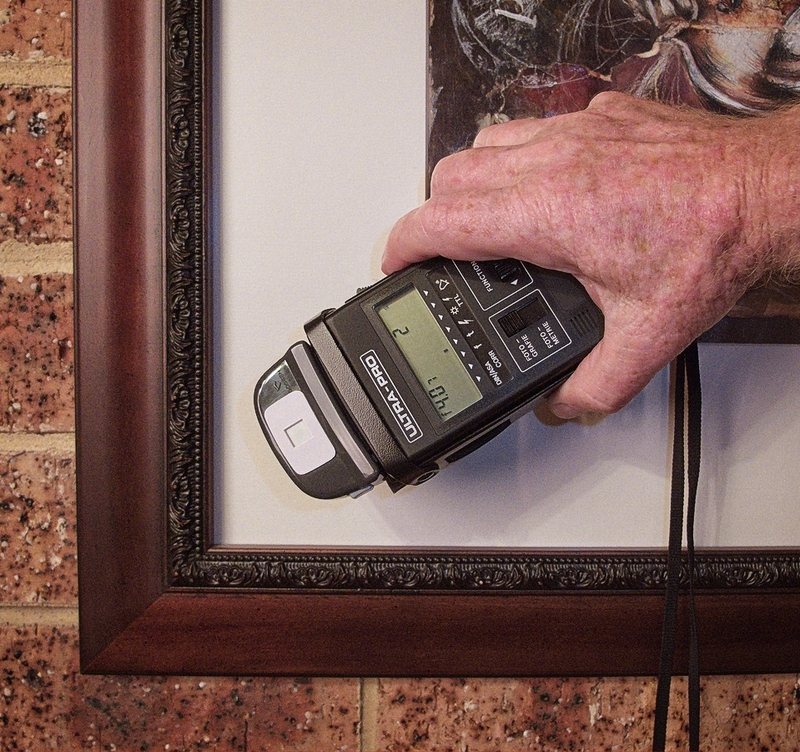 And for light metering, I use a reproduction meter, which is more accurate than the regular dome type incident meter that is often used. I maintain illumination variation within one tenth of a stop. The system I use samples the illumination intensity at 9 standard locations. Finally, I am extremely careful about sharpening the image. After de-mosaicing, digital images have an innate softness, which requires the application of some judicious sharpening. At later stages in processing, photographers can have the temptation to do various things to improve the look/impact of the image. Of course, for documentation of another artist’s work, such adjustments would be totally out of place. The work must be allowed to stand as it is. Because I am also an artist, I know where the line is between digital replication of the analogue original, and digital enhancement. Availability: Blue Mountains & greater Sydney area of NSW, Australia. Capture location: On-site or in studio.